This property has +/- 298 highly desirable acres and is located in the Burnt Store corridor of Southern Charlotte County, Florida. The Burnt Store Road corridor, south of the City of Punta Gorda, east of Charlotte Harbor and west of US 41. Land holdings by other residential and commercial developers as well as conventional platted residential land to the east. Agricultural. Zoning changes may be proposed that are consistent with the Comp Plan designation Village Residential, which allows residential development up to five units per gross acre. Wetlands are shown on the attached aerial but have not been delineated by the regulatory agencies. 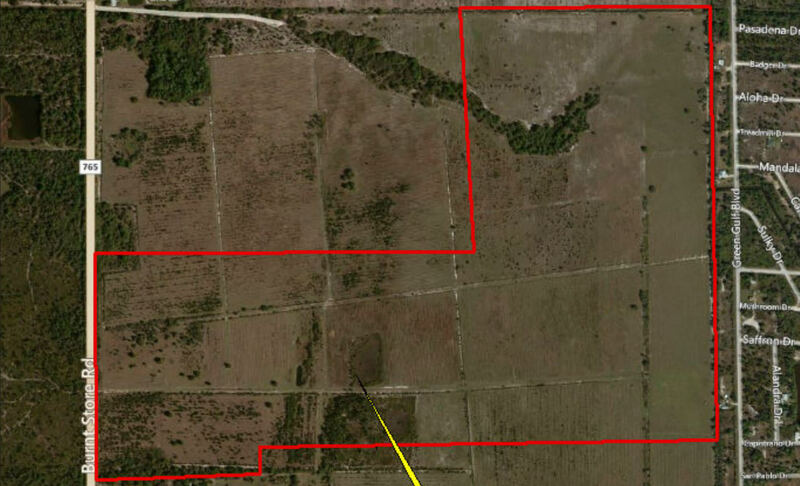 SWFWMD has issued a WUP permit for the current agricultural uses associated with the property. Audits revealed no hazardous waste impediments to development of the property as zoned. Charlotte County Utilities has expanded some utility capacity in the Burnt Store Area. Additional utility expansion may be required depending on final design and unit counts.